The details of life in Brooklyn are scant. His father, Dr. Frank Ende taught him much about nature. They had bees and ants in glass colonies to see the action. 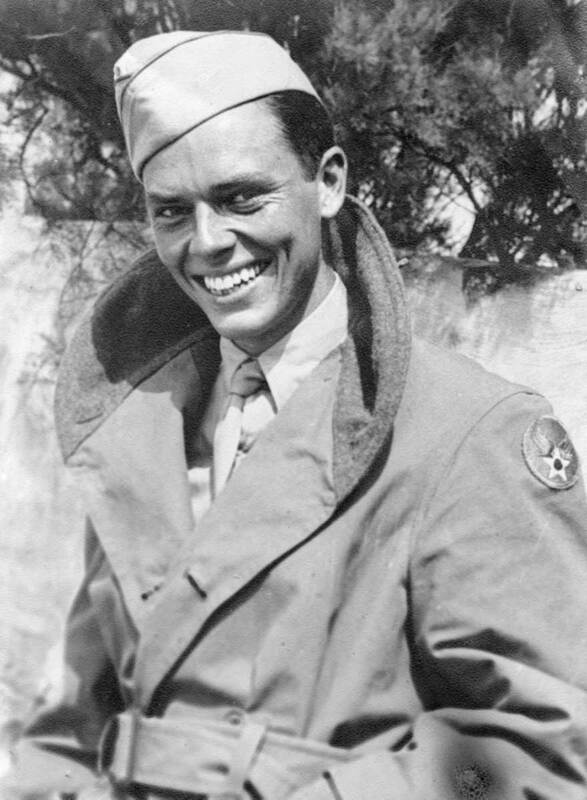 Frank Ende was first generation American, with both parents being born in Germany. He enlisted in the World War I as an army doctor. The horrors of the war took a toll on him and after his return he became disenchanted with the frivolities of the Roaring Twenties. Shell shocked and disillusioned, he took a post as ship’s doctor, and we never heard from again. Gladys Hartley, a vigorous individual of American heritage and English/Scottish descent, was not amused by this treatment. This abandonment occurred without the benefit or civility of a divorce. So she changed her name, back to her maiden name, Hartley. She then changed her children’s name , from the German name, Ende, to Hartley. She managed to sell the fancy brown stone affair they owned, just across the river, outside New York city, in Brooklyn. As Brooklyn was considered a swanky, her brownstone house was considered valuable.After the massive stock market crash and the resulting Great Depression, the Brooklyn property still had enough value to buy a small house and some extra property in Bermuda. This island paradise was the perfect place for a single mother to raise her two boys. Bronson had similar misconceptions as many from abroad, and was expecting to see tropical parrots and jungle leopards. 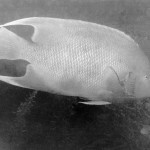 His disillusionment was short lived as he soon found tropical parrot fish and leopard rays. 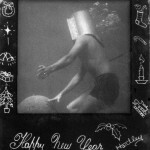 He built his first Diving helmet that year at age ten.As a youth he had many adventures. One of father’s oldest friends was ‘Smokey’ Wingood. Smokey ordered a diving helmet through a catalogue (Sear I think), but had to keep at my father’s house because Smokey’s parents did not approve. Not having the funds to make such a purchase, young Bronson (age 10) then figured out o way to build something that would achieve the same purpose. 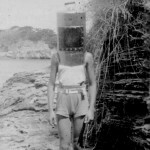 He took a heavy duty ‘white lead’ paint tin, cut out the front, installed one window, put weights at the bottom and voila, his first diving helmet. He even ended up making his own pumps. He attended Warwick Academy where he participated in planting one of the giant rubber trees across the street next to Lindos. He raised chickens and sold the eggs to the local hotels. He built his first boat, a sixteen footer, at age 14. This was quite an achievement to have ones own ‘trans’ as cars were only allowed for doctors. It had an inboard water cooled engine, deck, wind screen and a music radio. Though not a carpeted van, I suspect it saw its fair share of action. Despite his struggle with dyslexia, father attended Upper Canada College. 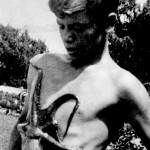 After a cruise on the Queen of Bermuda to New York he stopped in at the New York aquarium to present them with an octopus. They were amazed that anyone could successfully transport a live Bermuda octopus to them, as the vibrations on ships killed them. He had hung the container on springs. They were most perturbed when, after the school year he returned to take Homer back to Bermuda with him. 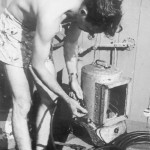 The thirties was the time of Dr. William Bebee’s exploratory descents in the bathysphere. Dr. Bebee and Barton went where no one had gone before, over a quarter of a mile down into the abyss. 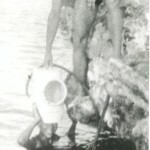 In fame what Cousteau was to the 60’s, Bebee was to the thirties. 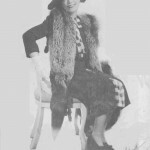 Gladys knew William from social circles in New York, and her son became a protégé of Bebee’s. 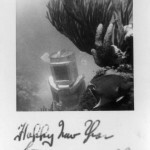 He had many adventures with Dr. William Beebe, who gave him his diving helmet which is on show at www.buei.org. A replica of his famous bathysphere is at the Bermuda Aquarium in Flatts village. www.bamz.org. Carol Grant Gould who wrote a book on Dr. Bebee came diving with us and wrote and article which appeared in the New York Times. 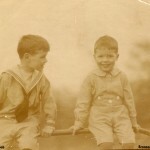 Click here to see that article.As for many, childhood was put aside as World War II swept across the globe. 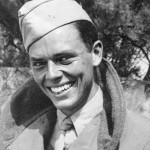 As he was still American, he volunteered for the US army and set his mind to pilot the crash boat. 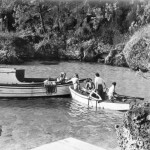 He set up an ingenious series of bike reflectors on select reefs in Castle Harbour so he could navigate at night ,at top speed, from the crash boat dock (by Longbird Bridge), through Castle Roads to the open ocean. Bermuda was stalked and surrounded by German Submarines, but had no torpedo boats. 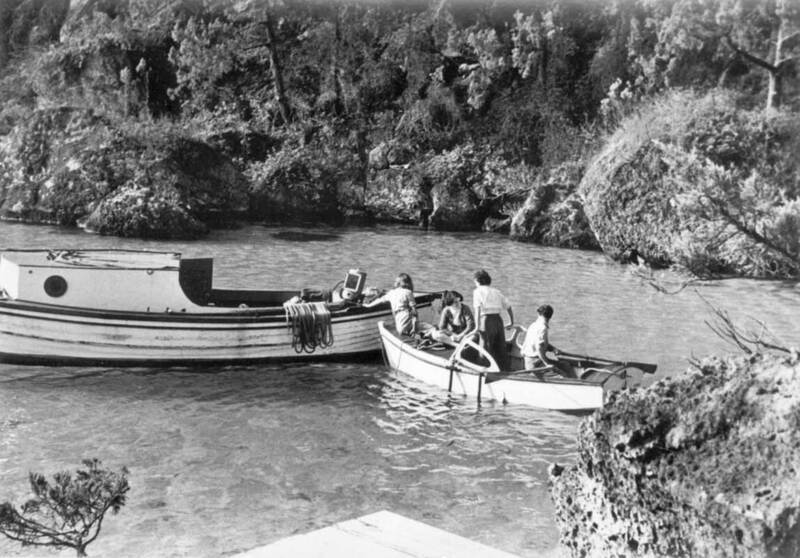 Captain Hartley would often be told to ‘go and investigate lights off south shore’, in very lightly armed vessel, loaded with aviation fuel. A brazen approach at full speed, with spot light glaring, always sent the subs subsiding meekly. On Feb. 6th, 1945 (When the crash boat was on slip) he swam out 200 yards, in 50 degree water, in rough seas to rescue three crewmen on a bomber that had crashed in the water late at night. President Truman instructed that he should be awarded the American Army Soldier’s Medal for heroism not involving actual conflict with the enemy (Check out his honorary mention). Apparently, no general was there to order him to drive through the fence to get to the water’s edge and swim out in shark infested waters to save anyone. He did it anyway. Bronson Hartley, at age 10, with prototype diving helmet. Homer wants my father to go back in the water. 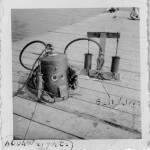 Early Bronson-built helmet and pump. Hartley Sr. devised remote triggers to make self portraits for greeting cards. This very large and very old angelfish decided that she had gotten this far without having to accept hand outs so why start now. Father was luck to have gotten this one shot.